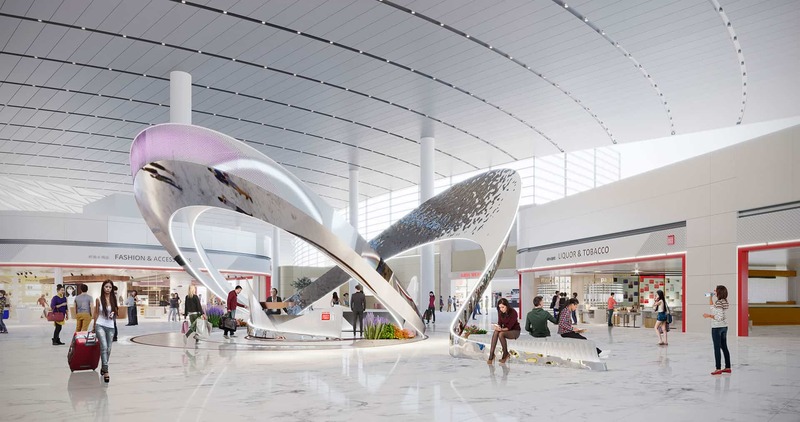 Leonard Design have won a bid to design a landmark sculpture for Incheon International Airport, the largest airport in South Korea, as part of a wider refurbishment of the award-winning duty-free shopping area. The landmark, designed for Incheon International Airport but commissioned by the three biggest duty-free retailers in Korea: Lotte, Shilla and Shinsegae, will be located in the busiest part of the duty-free shopping area and therefore entries had to be nominated by the retailers to ensure the highest quality design. Leonard Design was asked to pitch for the work in August 2017 and its designs were chosen above all other nominated designers. The brief was to create a ‘one-of-a-kind’ landmark within the terminal space which had symbolic character to represent the new Incheon International Airport terminal, as well as sculptural qualities to celebrate the continuous development of the airport. The sculpture is also to house two independent information desks. Ian added: “We took inspiration from the airport itself as flight is central to every customer’s journey. We used birds, or more specifically Incheon’s dancing cranes, and their elegant wing form to influence our design. “We also introduced some modern techniques to uphold the high standard of the airport. As the brief was to create something ‘one-of-a-kind’ we decided to turn shiny metal into a media screen – a new and interesting challenge – which involved perforating the metal with varying intensity and placing LED lights behind to ensure a seamless transition. “While airports are a necessary transition for travelling, as the world gets smaller the demand for quality transport hubs has grown. Modern airports are now considered destinations in their own right and therefore fight to have stand-out features which create the best possible image.